The 411 could hold a SINGLE 3.5inch device (like a HD), or a single 5.25 inch "half height" device, such as a CDROM. However, its the most common of the Sun cases. 511 - The 511 case is very old. It came with the Sun 2 or 3 series. It is a steel box about 45(W)x45(D)x25(H) with a whopping (and exposed) power supply, two case fans, and two DB50 connectors with three rows of pins. They usually contained some combination of QIC tape drive, and hard drive. These sound similar to what is sometimes described as a Sun "hatbox". The 611 could hold a SINGLE 3.5inch device (like a HD), or a single 5.25 inch "half height" device, such as a CDROM. It differs from the 411 by being longer than it is wide, while the 411 looks "square" from the top view. The 811 is the exact same size as a "lunchbox" chassis, and looks like it was meant to hold a single 5.25 inch "full height" device, such as a large HD. 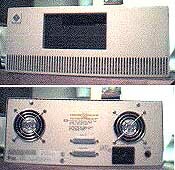 The "open face" variant usually had an 8200 or 8500 Exabyte tape drive, which utilized an 8mm casette, similar to modern Camcorders. I think the 911 was the only one *not* used for tape, DAT, or CD, etc. QUESTION How do you open a Sun 411 style case? On the sides near the rear, take a small tool like an ice pick, #0 screwdriver etc. insert into the second hole from the rear of the box, on the second row of holes from the top, you should hear it click when it releases. do this for both sides. Viola!! open 411 box. Be careful not to push too hard, though Sun engineers these things well, the little plastic latches will BREAK if you press on them with too much force. From the back and top of the unit, count three holes forward. Push something (a pencil works, or small screwdriver) through the hole in the second row from the top. (It's offset to the back if I remember correctly.) Do not apply too much pressure. It only has to move inside about an eighth of an inch. The top then sort of rotates forward. (There are some plastic flanges in the front bottom edge of the case which will be the center of the rotation. You may want to locate these first.) While the case looks sturdy enough, the plastic walls and rear fasteners can be broken with too much force. I have actually used a plastic coffee stirrer to open a 411. QUESTION My old Sun cdrom recently died and I'm trying to put another drive into the 411 case. Problem is that the 50 pin scsi connector cable which seems to be soldered to the backplane in the case has the little finger in the middle of the plug facing down while all modern cdrom drives seem to have the corresponding opening facing up. How do I put a new cdrom drive in that case since the cable is too short to turn it over? up by small amounts at a time all over, to avoid damaging the prongs. need a vice and some soft wood to press the assembly back together.